I've got this new, weird piece in an exhibition called INHABITED, opening January 25th, 2019 in Fort Lauderdale at FatVillage Project Space. Receptions are happening 1/25 and 1/26 with an artist's panel on 1/27 at 4pm. Show runs 'til April 1, 2019. The SheShed at the Woodstock Artists Association Museum was so much fun! Here's a quick look inside. 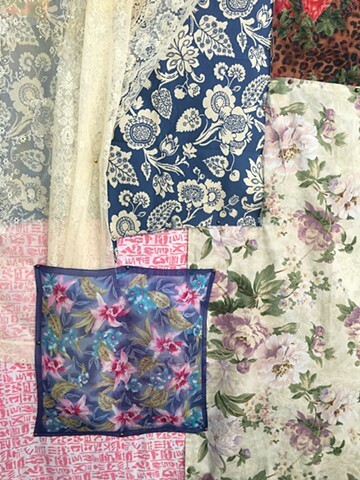 I spent the (lovely!) month of June as a research fellow at Cincinnati's Lloyd Library exploring their collections and collaborating on a design project alongside Jonathan Frey. While there, we started a lot of new work and completed this poster design, which will be printed and available to the public soon. On July 7 & 8th, please join me in Woodstock NY for my Habitat for Artists (HFA) installation, She Shed! I'll be in front of the Tinker Street museum from 12-5 on Saturday and Sunday. 1st Place at the 2018 Penn College Regional Exhibition! I was honored to be awarded first place in this regional exhibition alongside a great group of artists. I only wish I could have been there in person to experience the moment! Check out two large-scale pieces made especially for the 59th Annual Three Rivers Arts Fair in Pittsburgh this June! Gallery hours for the Trust Arts Education Center can be found here. You can still visit Off the Wall until August 2 at the Spartanburg Art Museum in beautiful Spartanburg SC, but if you're just curious and not nearby, I created this short video to accompany the Audio Guide they produced for my work. 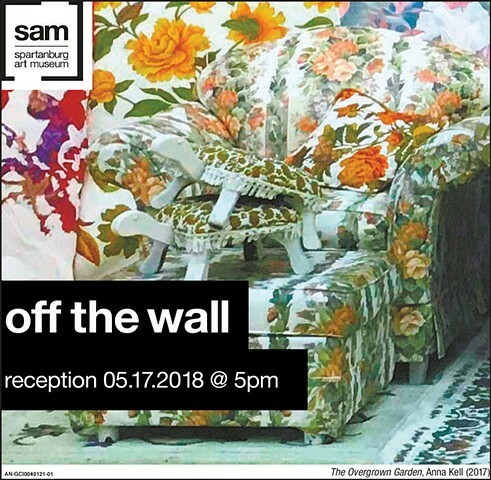 Off the Wall is on view through August 5, 2018 at the Spartanburg Art Museum. You can also check out Spartanburg's art walk for a fuller picture of the arts scene there. Check out this short edited interview I did for the Pennsylvania Convention Center in conjunction with the recent celebration of their permanent collection! And if you're at a "con" in Philadelphia, check out this or this one or even this third painting. My solo exhibition Flowers & Trees opens at the Arlington Arts Center in Arlington, VA in the Chairmen's Gallery October 14-December 16, 2017. There will be an opening reception on October 14th 6-9pm and I hope to see some friendly faces! Closing talks by the FALL SOLOS artists on Saturday December 16th from 1-3pm in the galleries. 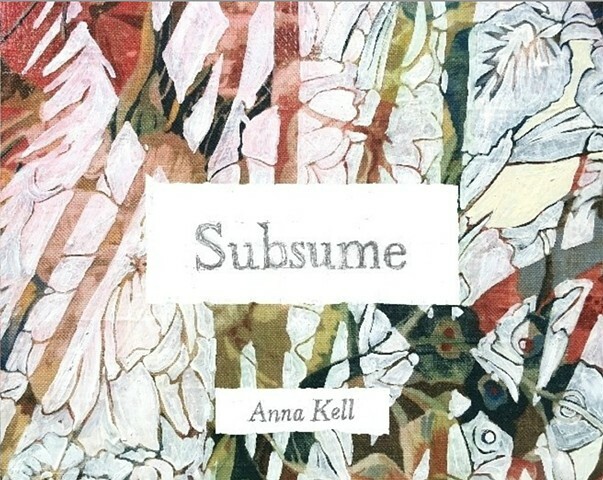 Subsume has been in the works for over a year, but I'm proud to announce that this beautiful book is now available for purchase from Puppy American Press here! The book consists of well over 100 drawings, each of which is reproduced and framed by details from a recent series of paintings. The drawings were made observationally, between 2014 and 2016, while I nursed my first son, Rayburn. Open August 29 - December 16, 2017 at the Miami University Art Museum in Oxford, Ohio. This quadrennial exhibition brings together an assemblage of nearly 90 works of art created by 73 artists. Featured in all three of the museum’s changing galleries will be works produced since the 2013 exhibition by current and emeritus faculty and alumni. This exhibition series is a joint partnership with the Department of Art. The exhibition presents viewers with a glimpse into recent artistic explorations by Miami University art faculty and graduates from the art programs on the Oxford, Hamilton and Middletown campuses. I have a collage on view in the Small Works 2017 exhibition at Trestle Gallery in Brooklyn, NY July 6-27, 2017. Opening reception is July 6, 7-9pm. The show was curated by artist Bill Carroll. I'll have a few paintings and this site-specific work at Bailey Contemporary Arts in Pompano Beach, FL June 6-July 14, 2017. Reception is June 10 6-10pm. Show will run Feb. 28 until the closing artist's talk and reception on March 24th, 2017. Show runs January 19-March 3, 2017 with an opening reception 5-7pm on January 19th. Exhibition runs January 27-February 12, 2017. Opening reception is Nov. 3rd, 6-11pm. I'll be showing a few paintings in SOMEPLACE ELSEWHERE, an exhibition curated by Victor Lopez at Gallery Protocol in Gainesville, FL. Reception is July 8, 2016.
for the $10,000 William and Dorothy Yeck Award% at Miami University. Show runs Jan. 12-Feb. 12 with a reception held on Jan. 29th from 4:30-6pm. 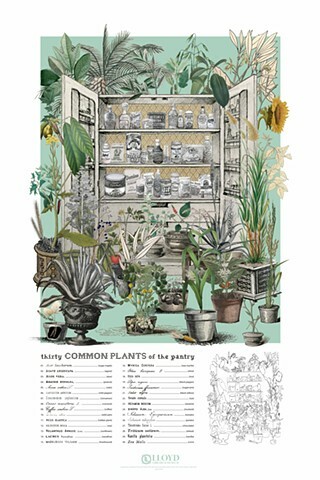 Plant Sale Show will open Saturday January 16th at Rabbithole Projects in Brooklyn, NY. All works will be on sale and, if sold, removed from the exhibition. 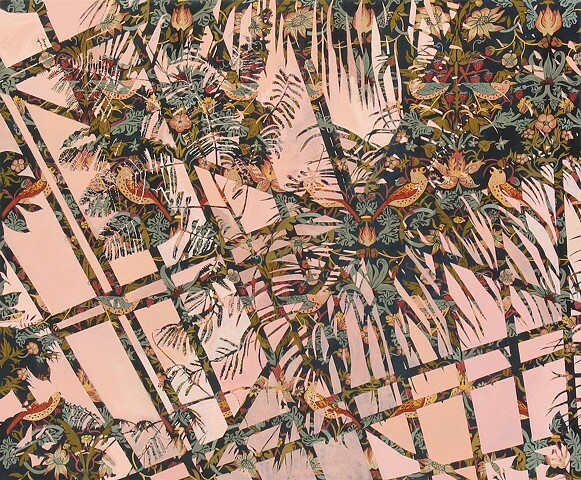 Curated by Krystyna Printup. Anna will present recent paintings and drawings in a group show this winter at Susquehanna University in Selinsgrove, PA. The opening reception will be Jan. 23, 2016 from 7-9pm and the show will run through Feb. 28. New work from artists Anna Kell and Liz Parrish will be shown at www.convergegallery.com the Converge Gallery| in Williamsport, PA from Nov. 20-Dec. 19, 2015. Anna will be presenting a new installation, The Garden, at this group show at the Indianapolis Art Center from September 25-November 21, 2015. 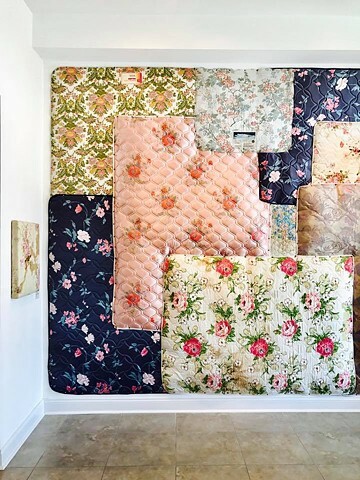 Anna has a 25 foot mattress mural on exhibit in the Gateway Building/Penn Station Newark in the show You Are Here Now with The Gateway Project. Show runs through October 1, 2015. Anna will have a solo show at the CCA Bedminster in Bedminster, NJ April and May, 2015. The reception is April 10 6-8pm. Anna is on a shortlist of finalists for the biannual Birth Rites Collection award. The winner will receive a residency at the Women’s Art Library, Goldsmiths University, London plus a stipend and winning work to be included in the Birth Rites Collection, Salford University. 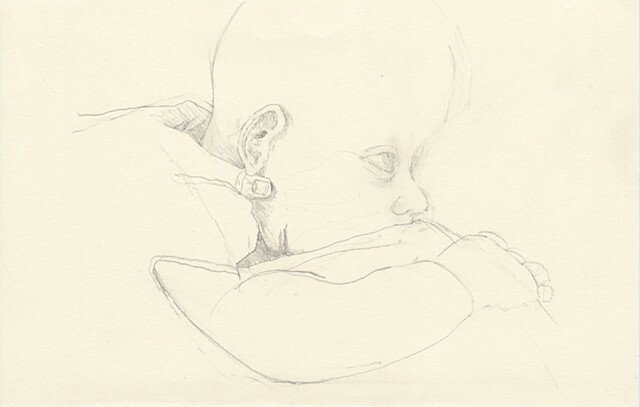 Her nursing drawings will be screened digitally at Media CityUK in the Egg Suite on March 13th 2015. Anna's painting, White Lace 2, has won 3rd place in the 2014 International Juried Exhibition, juried by Evonne Davis. 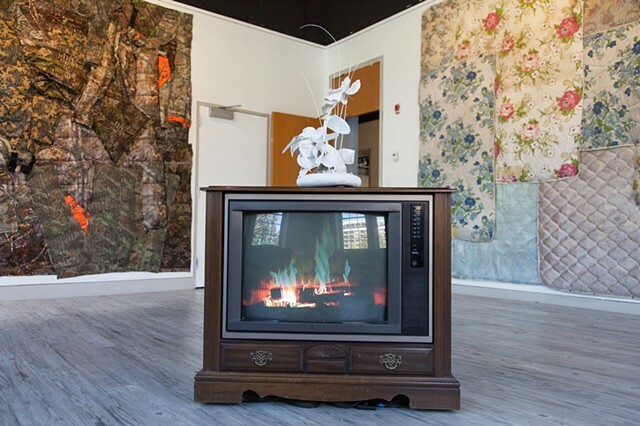 Reception will be held Friday, November 7th from 6-8 p.m.
Bushwick Art Crit Group- Invited participant in a group critique on October 15, 2014 at the Brooklyn Fireproof Building gallery, 7-9pm. Open to all. Come by our open studios at the Triangle Arts Residency this May 1st and 3rd, 2014 in Brooklyn in the Dumbo Arts District. A must see art event. From December 12, 2013- February 13, 2014 Anna will have two paintings on exhibit at the 2014 Young Painters Competetion for the $10,000 William & Dorothy Yeck Award at Hiestand Gallery at Miami University, Oxford, Ohio. Anna was recently awarded a generous studio residency through the Triangle Arts Association and will be in residence in DUMBO, Brooklyn from January through June 2014. Anna will have a solo show August 30- September 27th, 2013 at the Basile Gallery at Herron School of Art & Design in Indianapolis, Indiana. Check out Anna's interview with Erica Funke of ArtScene. Also, an evening news segment about Anna's Lewisburg Junk Walk. Pentimenti, a solo exhibition by Anna Kell, will open January 16 in Lewisburg, PA at the Bucknell University Downtown Art Gallery. Reception & snap talk January 24th, 6-8pm in the gallery. The show will be up through March 24, 2013. This biennial exhibition of work by MU Department of Art faculty (and alumni including Anna Kell) will present visitors, and prospective students, with a sampling of the diversity and talent of contemporary artist/educators. Show open January 15 until May 11, 2013 at the MU Art Museum in Oxford, Ohio. 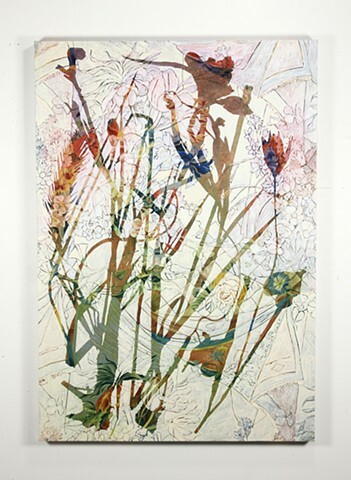 Flowered Over is a solo exhibition by Anna Kell at University of Montevallo in Montevallo, Alabama. The show will open at the Bloch Hall Gallery on September 27th and will remain on view until the closing reception and lecture on Thursday, October 25th 5:30-6:30pm. 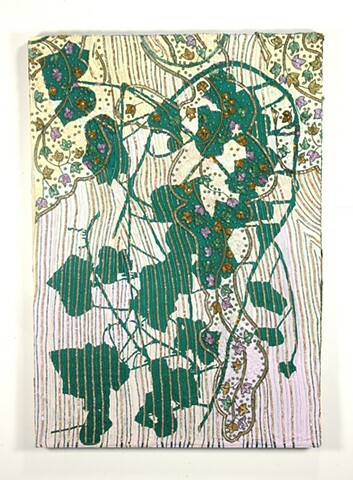 Anna's work will be included in a group show called Centering the Margin at Root Division in San Francisco March 7-24th, 2012. Reception is March 10th 7-10pm. Untitled Gainesville Stain will be featured in the Mid-Atlantic New Painting 2012 Exhibition January 20- February 24, 2012 at the Ridderhof Martin Gallery on the campus of the University of Mary Washington in Fredericksburg, VA.
Anna Kell and Jonathan Clyde Frey will present their collaborative drawing piece "Tri-Cities Busted" October 14-16, 2011 at GRIDLOCK, the 2nd annual conference of the Department of Cultural Analysis and Theory at Stony Brook University. The piece will be on view at the AC Institute in Chelsea and the artists will deliver a talk about the work. Every weekend in September 2011, you are invited to the Governor's Island Art Fair. Anna will have a room there (Building 12, Section D) showcasing her artwork. The Governors Island Art Fair is open in September - Fridays (11am-4pm), Saturdays & Sundays (11am-6pm). 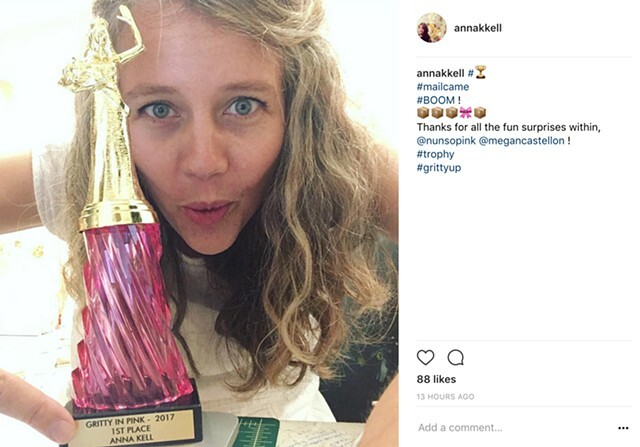 The Tennessee Arts Commission recently awarded Anna Kell with an Individual Artist Fellowship in the Visual Arts! She is one of two visual artists honored statewide. Anna will be participating in a group show at the Caelum Gallery in Chelsea, NY. Show opens w/ reception May 31 and runs 'til June 11. 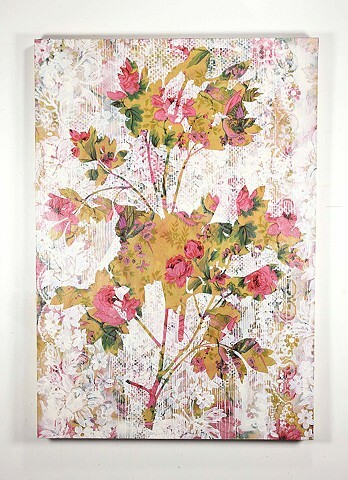 Anna's piece, Rose Queen 1, is included in a group exhibition entitled Intimacy at the ARC Gallery in Chicago, Illinois. Anna is the featured artist in the Project Space at the Jolie Laide Gallery in Philadelphia this October 1-16. Jolie Laide is exhibiting 3 of her mattress paintings from the series, glazed over. Reception is Friday, October 1 6-9 p.m.
On September 22, Anna, with collaborator Jonathan Clyde Frey, will be installing Lamp Forest. This interactive installation will be on view at The Rover in New York City. The opening reception takes place Friday, Sept. 25 7:30-9pm. Lamp Forest will be on view through Sunday evening. Lamp Forest is generously supported through a grant from the Research Development Committee at East Tennessee State University. In February 2010 Anna was invited to participate in the Winter Group Show at 3rd Ward in Brooklyn, NY. She showed Hothouse at Dusk. Check out The Logic of Sensuality, written by Patrick LeMieux.